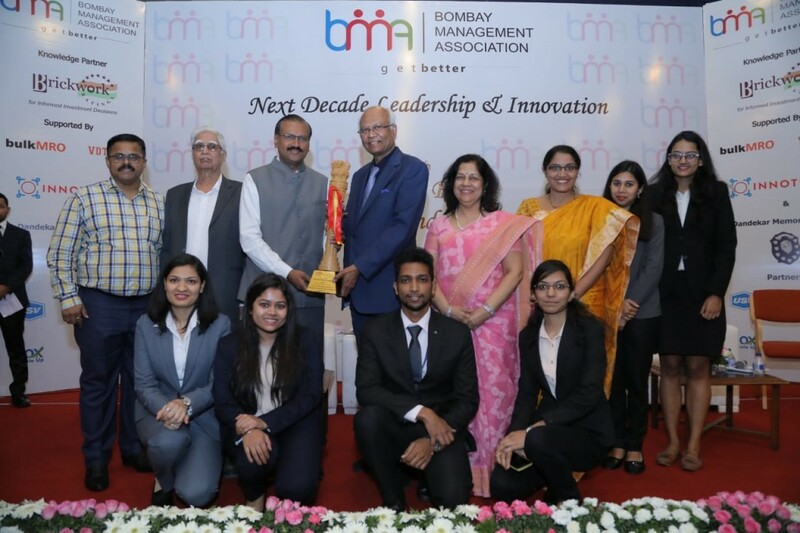 S. P. Mandali’s WeSchool added another feather at the 40th BMA Awards function when the Academic Award Jury recognised and honoured the Institute for its excellent contribution towards the education of management students for the year 2017-18. The award comes under the category of ‘Special Mention by Jury’. The Award ceremony was held on 15 March, 2019 at Yashwantrao Chavan Pratisthan, Nariman Point, and Mumbai. Dr. R.A. Mashelkar, President, Global Research Alliance, Former Director General, Council of Scientific and Industrial Research (CSIR) graced the felicitation ceremony and gave away the awards to the awardees. Other dignitaries included President Dr. Murtaza Khorakiwala, Ms. Chhaya Sehgal, Vice-President, BMA and the former BMA President Mr. M.D. Agrawal. Adding to the glory and sunshine of the day were two more laurels bagged by the students of the Institute. BMA every year gives out best student award, in the management space. Ms. Alisha Maheswary of Welingkar and Ms Sweta Basu, WeSchool won in the best student category for their project in ‘Change in scenario of Indian Businesses in 2030′. The jury considers academic performance, extracurricular activities, roles in student-cells or committees, CSR, pre-placement offer, self-development and summer projects while deciding upon the winners. The students are given a theme too and they have to present their views on the same. This time the theme was Change in the Scenario in Indian Business 2010-30. Dr. Yusuf Khawaja Hamied got the life time achievement award at the hands of Dr H Khorakiwala. Management of the year award went to Mr. Rajesh Gopinathan,Management Woman of the Year award went to Ms. Aruna Jayanthi, Entrepreneurship Award of the Year went to M/s NYKAA and the Special Jury Award went to Mr. Shailesh Haribhakti under the corporate Leadership Awards. The awards were under the categories of Corporate Leadership Awards, Academic Award – Institution Academic Award – Faculty and the Academic Award – Student.